Suppose that you're sitting on the bridge crane soon to be installed in the Assembly Hall — you are facing west and here's the panorama that you would be taking in. Down on the floor to the left, what appears to be crop circles in concrete is in fact the deep anchorage plots of the giant Sector Sub-Assembly tools presently under fabrication in Korea. 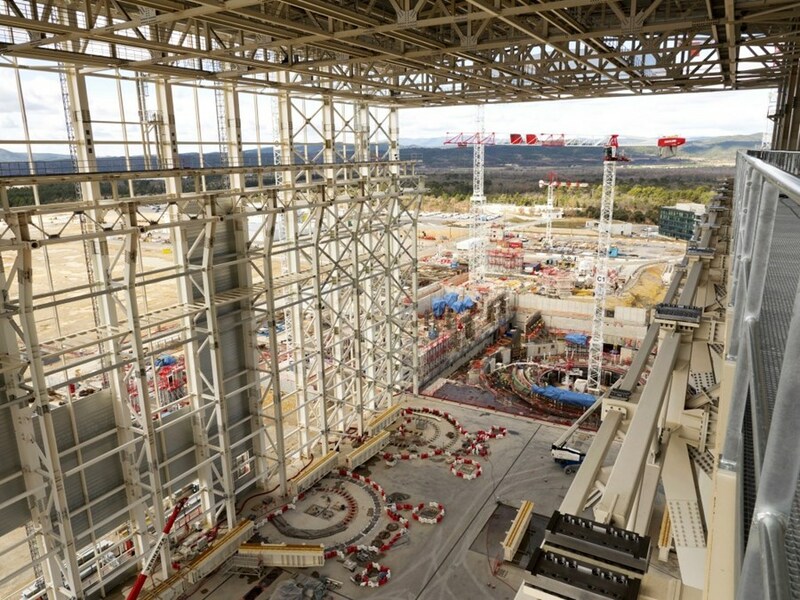 On both sides of the steel structure of the building, the railings that support the beam you're sitting on run the whole length of the Assembly Hall and will later run to the far end of the Tokamak Building. Further out is the circular pit where the ITER Tokamak will be assembled. If you perch long enough on the crane beam, you'll see the thick concrete walls of the bioshield rise, level after level, until they form a circular fortress around the Tokamak. Unfortunately, no one will ever sit on the bridge crane ... It's a pity, for the view is really breathtaking.